One of the most fascinating things to me about the Indie Megabooth and Indie Minibooth at PAX is how a game can completely come out of nowhere for anyone observant enough. Jared and I were waiting in line with Eric to play Karmaflow, and Jared’s eyes wandered off to the left. He saw Rex Rocket from CastlePixel being played by another gentleman, and he immediately drew my attention to it. I’m super glad he did, because this little action game for Steam has suddenly skyrocketed to my most anticipated indie games list, and may even be my Game of PAX East if I’m honestly thinking critically enough. With my immediate praise out of the way, allow me this: If my words aren’t good enough, you can watch me mash one of the game’s bosses to see the game (and me) in action. 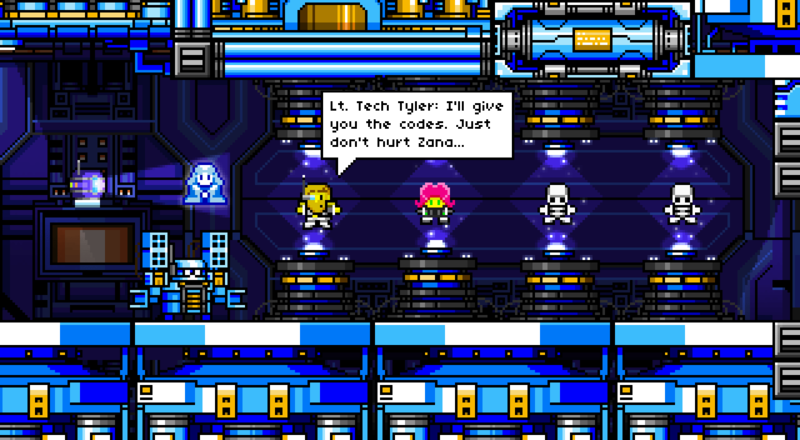 In Rex Rocket, you play as…Captain Rex Rocket. He’s a former war hero who now spends his days transporting scientists around the universe. The story takes off when some bio-engineered terra-oozlings he’s transporting for some scientists break free and wreak havoc. It seems like a story reminiscent of a summer blockbuster–like the kind of game you’d bring a bag of popcorn to if you weren’t too busy playing it. I think Rex Rocket will rely more on its gameplay and presentation than its story, but that’s just the impression I got on the level I played through. For all I know, the game could wind up like Cave Story and reveal an impressive amount of story hidden underneath layers of gameplay. Jared had a chance to talk to one of the developers at CastlePixel, Tyler, while I was off doing other things; he said that Cave Story and A.N.N.E. were big inspirations for him. Just looking at the design, you can tell why I’ve repeatedly mentioned “Mega Man fans, pay attention,” in the various Podcasts from PAX East. It looks like a Mega Man game as far as background and foreground designs go, but the characters almost have this charming lego aesthetic to them. I quite like the way it looks; the design shows it’s a game that’s not going to take itself too seriously (or seriously surprise me if it takes some sort of dark turn). Various instances in the plot, like soldiers saying, “It’s Rex! 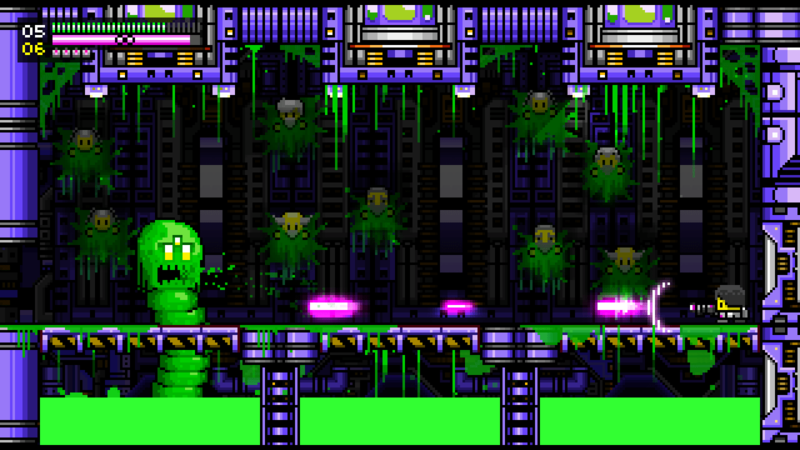 We’re saved!” and then being…um…turned into slime-monsters, caught me by surprise every once and a while. Okay, okay. But how does it PLAY? Does it control well? Absolutely it does. It plays like a tighter Mega Man game. I wasn’t ever burdened by the controls. They were simple enough. Mash one button to fire a weapon (and there were several of them found within the single level I played, some hidden, some not), mash another to drop (or lob) grenades when you get them. Weapons were versatile and plentiful. 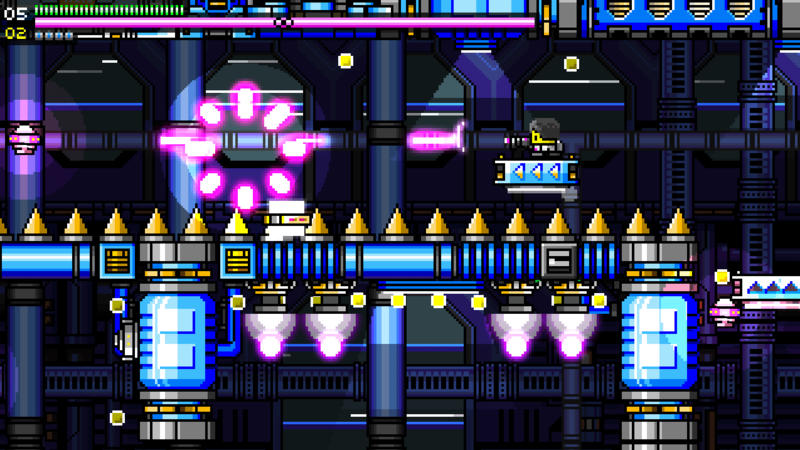 You start out with a simple gun, but you can find a spread-type weapon and probably tons more as the game progresses. One of the more interesting mechanics, to me, is honestly what’s going to set this game apart from most of its contemporaries. 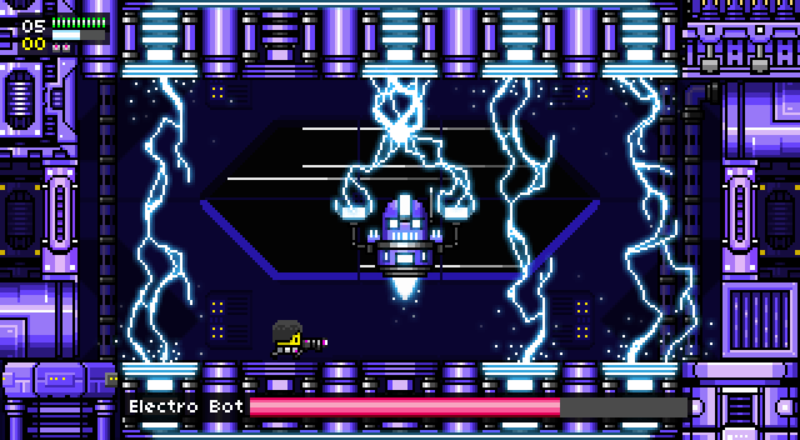 Like any shooter post-Mega Man 4, you can fire a single shot (rapidly) or charge up your weapon by holding the button. 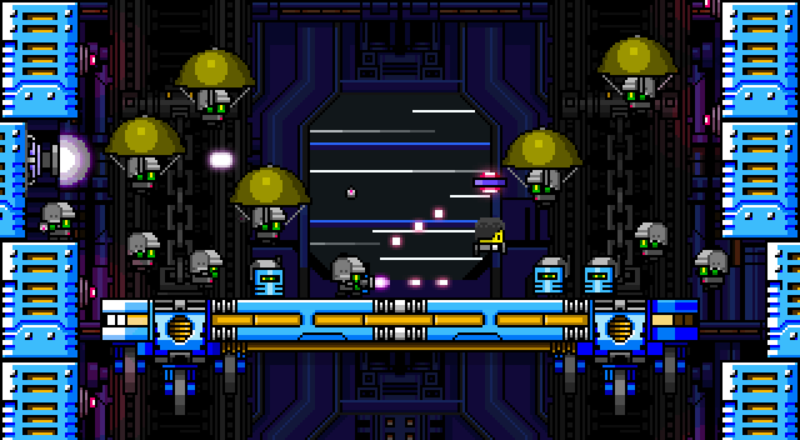 In Rex Rocket, Rex can actually use his shots to influence physics and increase the length or duration of his jumps. Firing at the ground rapidly allows you to stay in the air for a little longer. Firing a charge shot while in the air propels you a little higher. 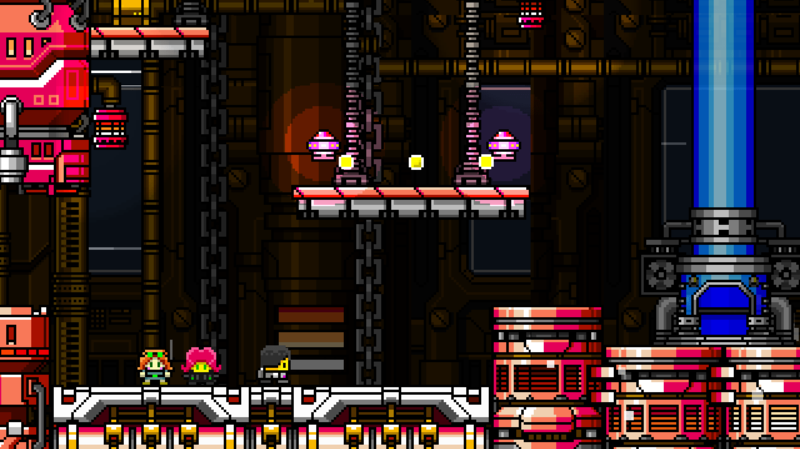 This is the kind of stuff that will allow for decent platforming, and a truly intense experience if the level design gets tricky enough. Based on the very full level I experienced filled with twists, turns and challenging moments, I have a feeling the game will progress exactly like I think it should. Things may take a turn for the truly obnoxious level of challenge after a certain point. I could be wrong, mind you, but as a guy who likes to go through Hell, I hope I’m not. Like I said before, Rex Rocket is a game that completely took me by surprise at PAX East. I had no idea who CastlePixel was, but…playing through this demo makes me want to encourage all of you to follow the developer, check out the official site, and learn as much about this game as you possibly can. It does some crazy things, and it’s coming your way sooner rather than later. Considering its influences and what the game looks like, I once again reiterate: Mega Man fans have a reason to be excited, and I’m not talking about something from Comcept. 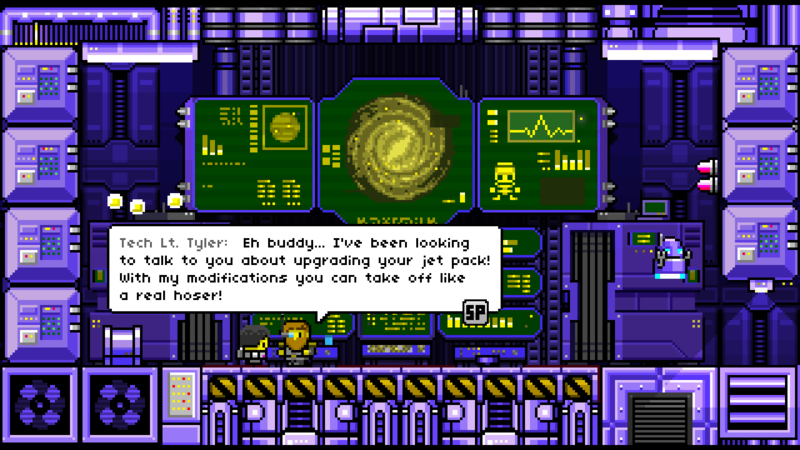 We’ll offer more information from CastlePixel and Rex Rocket as the game gets closer to release.